You are here: Home / Denver Real Estate News / Denver Realtor on CNBC, My Dad! Denver Realtor on CNBC, My Dad! 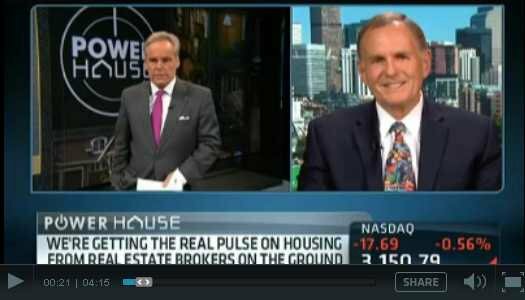 Denver Realtor Larry Hotz appeared on CNBC’s Power Lunch. Click to see the video. 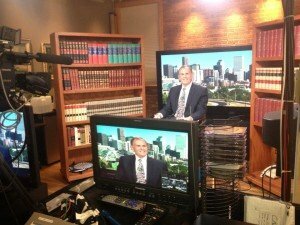 The Denver real estate market was explained and exposed when our own Denver Realtor Larry Hotz of The Kentwood Company appeared on CNBC’s Power Lunch on Thursday. It’s not everyday that I get dressed and grab my coffee to go into a television studio for work, but that’s exactly what my dad and I did this week. I was very proud of my dad and business partner as he explained to the country that the Denver market is stronger than it’s been in seven years. And it’s true! The number of home sales are increasing as we move into the traditional Spring Selling Season. Even more surprising is that the number of homes for sale continues to decline. Right now, there are less than 6000 homes on the market as sales are approaching 1000 homes per week. That means there is only a six week supply of homes for sale. In a balanced market, there is usually 3 months of inventory. That’s a phenomenal contrast to the last few years. Even two years ago, some parts of the Denver market had a 28 month supply of homes for sale. This substantial decrease in the number of homes on the market is making headlines. I took this photo as Dad was explaining the Denver real estate market. I have to admit that it was quite thrilling to be behind the scenes at the small studio located in downtown Denver’s Golden Triangle. Tyler Matheson of Power Lunch was interviewing Dad from CNBC Headquarters in New York City. The local engineers had him sit in front of a large screen television displaying the Denver skyline as if it was a window in the background. Oh, TV is so different than reality sometimes. We arrived about a half hour early. That gave the staff time to put a microphone and headset on dad. Watching my dad get his make up touched up and sport his favorite golf tee tie, he certainly looked the part of a television correspondent. I actually don’t think I’ve ever seen him in any makeup before. Well, the exception was one Halloween when he was Mickey Mouse. How did they choose my Dad from all of the Realtors in Denver? that was the first question I asked him when I learned about his upcoming appearance. “Evidently, they found my site in the Google results for luxury Denver real estate and looked at my videos on our site”, Dad told me over the phone. He had to tell me on the phone because they first contacted him while he was on vacation in Hawaii. “At first, they wanted me to do the interview from their studios in Honolulu last week”, Dad said. But, they pushed the schedule back when I asked to wait until I got back to Denver”. I personally think my dad’s Hawaiian vacation is to thank for his tanned face and relaxed and rested presence on camera! “When I was preparing for the questions I might get, I had many things ready that I just couldn’t use. Like, Denver builder, Steven Holben, asked me to make a point about the low inventory of homes on the real estate market. He wanted me to point out that inventory is reduced by 70% since 2007. I don’t think I made that point and several others. Still, it was fun even if I was a little nervous”. Of course, he is his own worst critic. He did a great job of explaining our Cherry Hills listing and others listed by Doug Hutchins and Steve Travers who have written on this All Denver Real Estate blog. And, he really did make the point our realty market has become a “Seller’s Market”. What many people don’t know is that my dad was destined to be on TV. Dad graduated from the University of Denver in 1970 with a major in Mass Communications. But, he hasn’t used that skill on television since then except for making several videos on our web site. All in all, it was an excellent experience. I just couldn’t be prouder of my dad. He did a great job of representing what’s going on in our market and representing The Hotz Team. Now, who do I speak with about getting our own show? Great Article! The Denver Real Estate market is on Fire. Do not wait if you are thiking of buying or selling. Larry, great job. You are a natural. I am sure you will be getting more offers to speak. And maybe a new real estate ‘reality show’. (: Congratulations!! The Real Estate Show is Elizabeth’s idea. I hope she is kidding. It would kill my Sunday afternoons! You sound great and don’t even look too bad. Congratulations my friend. Now I want my condo back ! George and Kathy sold their Denver condo in 1980’s. I wish they still had it too. It could sell for more than double its 1986 value.